Avocado Lime Cheesecake is da bomb! Trust me on this one! I was skeptical too! I mean I LOVE avocados, but in a cheesecake? Come on! That's just weird!! Or is it? 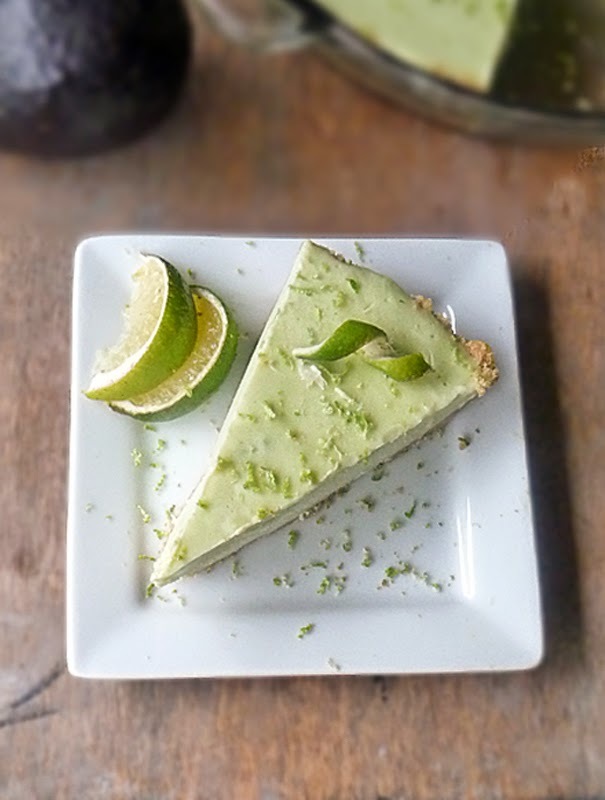 I have always wanted to love Key Lime Pies like most normal people in the world, but I just can't - I'm not normal. I have yet to meet a Key Lime Pie that is to my liking. Typically they are too tart and it makes my lips pucker and toes curl just thinking about it <shudder>! 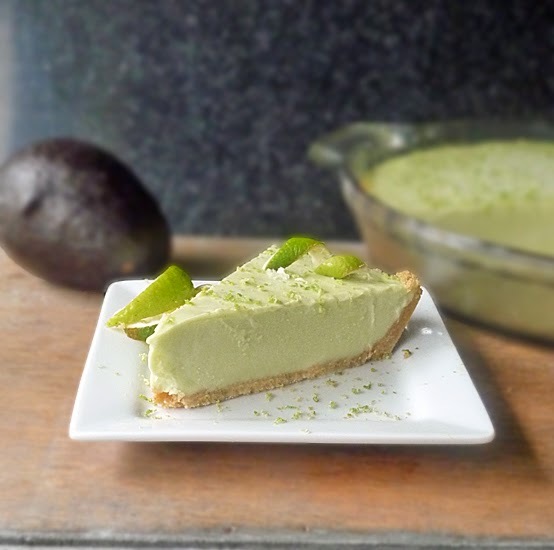 I went out on a limb and gave this Avocado Lime Cheesecake a try because it had lots of good reviews on allrecipes.com, and, as I said before, I LOVE avocados! They are healthy and delish in everything, so why not? Y'all I am SOOO glad I didn't turn my nose up to this one! Whoa Nelly this is a good pie or cheesecake - whatever you call it! 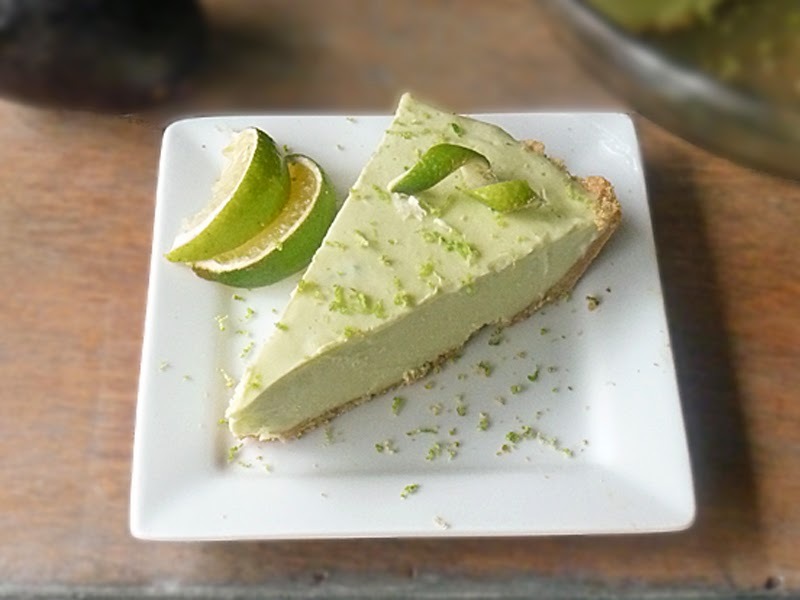 This has the perfect lime flavor for which I have always wanted in the lime pies I have tried! I cannot detect the avocado at all. I can't decide if that is a good thing or not, but I can assure you when I need a refreshing dessert, this is the one I will turn to from here on out! I would be cheating y'all if I didn't mention how awesome the graham cracker crust is too! It's super easy to make it yourself, so no need to buy one of the stale tasting pre-made ones. If I'm left alone with the crust I would eat it all and not have any left for the pie! It's really good and worth a little extra effort!! It's true! This is really a frozen dessert which is the biggest drawback for me as I'm not a huge fan of super cold food, but I let it slide for this one because it tastes so good!! When I'm ready to serve this pie, I take it out of the freezer, slice it and plate it and then let it thaw a bit before serving. I like to slice it while it is still frozen so the crust doesn't separate from the filling and it just looks prettier too! In the bowl of a food processor , pulse a sleeve of graham crackers until finely ground. This should be about 1 1/2 cups. Add 1/3 cup sugar and 6 tablespoons softened butter and pulse until combined. Press graham cracker crumb mixture into an 8 or 9 inch pie plate and set aside. Heat 1 1/2 cups heavy whipping cream in a small saucepan until warmed, but not boiling. Add 3/4 cup sugar and stir until sugar dissolves. Remove from heat and allow to cool. Wipe out the bowl of the food processor , and add the meat of 1 1/2 avocados and 6 ounces cream cheese. Pulse to combine. Add 1/2 cup fresh lime juice and a pinch of salt and pulse until smooth. Add cooled cream mixture and pulse just to combine. Give it a taste and fall in love with the delicious flavor of this avocado/cream mixture! Pour avocado/cream cheese mixture into the prepared pie crust and smooth the top. Place in freezer for several hours or overnight. When ready to eat, remove from freezer and cut into servings. Garnish with lime zest if you like, and allow to thaw a bit before serving. Enjoy! Definitely sounds worth a try - I love all the flavors in this! It's gorgeous! I'm like you, I don't love super cold foods either...I microwave ice cream! haha I also love avocados and will definitely be giving this one a try, esp since avocados are so cheap right now! I know right?! If you have someone who doesn't like avocado you could definitely get by with telling them it is key lime - they'll love it and will be shocked when you tell them the secret ingredient! Yum! How pretty, I love the flavor combo! I would have been totally skeptical too without your recommendation - thanks for trying it for us:)! I am looking forward to trying it out! what size avocado? large or small? Laci, thanks for asking! I used 1 1/2 Haas Avocados which are the darker, smaller avocados. I will clarify that in the recipe. Thanks! Sounds delicious and lovely to look at too! La crema , que tipo de crema es , Saludos desde Mexico. Do you find that it starts to brown if you don't eat it all right away? Not at all! The cream cheese and the freezer protect the avocado from the elements that would normally cause it to brown. Plus, it disappears quickly haha Thanks for the great question! Fantastic! I hope you love it as much as we do. Totally fine to make ahead and store in the freezer. Enjoy! Yay! I'm super excited to try! Thank you so much for posting! Can you please clarify what type of cream is used for this recipe? 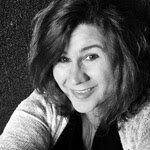 Whipping Cream or Heavy Whipping Cream? It is heavy whipping cream. I apologize for not clarifying that in the recipe. Thanks for letting me know. I will update. Have a super week! !